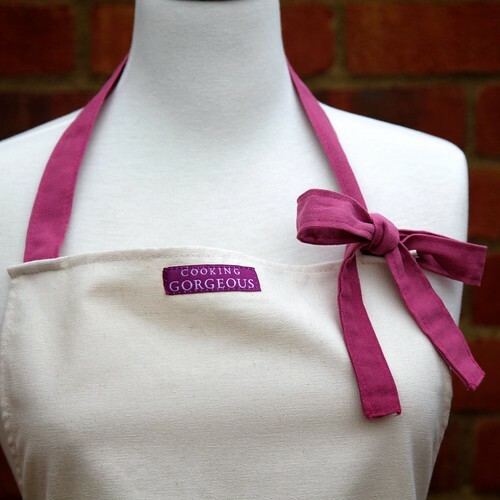 I’ve teamed up with www.cookinggorgeous.com to offer you the chance to win a beautiful apron. All you need to do to is leave me a comment in this post by Friday 10th June. The winner (who will be picked at random) will receive one Mini Pinny OR Bottom Line apron of their choice. Competition open to UK residents only. www.cookinggorgeous.com is also offering ‘A Slice of Cherry Pie’ readers 10% discount on all orders placed by 30th June. Simply quote the discount code in the box below. Discount code valid for all orders including those shipping internationally. Good luck with the competition and happy cooking! Previous Post Easter Cake Bake 2011 – The Winning Cake! great aprons! hope I’m lucky for a change! Wonderful and delicious blog Julia, bravo! I’d love to win one of these aprons – there is nothing like wearing a proper apron or pinny when you bake! I could definitely do with a new apron! Wonderful apron! I already have your book. What a grown up apron! I love the aprons, very cool! WOW! Lovely apron, could do with this to make me feel more glamorous in the kitchen! I woould love to win one of these aprons/pinnies for my wife – so that she could keep herself pristine in the kitchen whilst watching me cook her dinner and doing the washing up. You can’t beat a pretty pinny. You can never have enough aprons! Too bad it’s only open to the UK. I always cook with an apron-I’m a messy cook!! It looks lovely, good luck! I hope you get a lot of entries!! I’d love to win one of those aprons. I love a stylish apron. ooh I could do with a new pinny, mine is an old one that my mum bought from the RSC,it has the three witches on it, stirring up a brew! These ones look much more stylish. How I would love to wear one of those lovely aprons at my secret dinner events! Wow …. the apron is Cookinggorgeous! Love the apron. Would love to win. So lovely to read all these comments – delighted that you like our aprons. They are all beautifully made in England and I’m sure you will look Cooking Gorgeous in them! Good luck to everyone who’s entered! What a gorgeous apron – I’ve been looking for a new one! Hope I’m not too late etc. By the way, I found your site via your fabulous cookbook.